Parsnips, Carrots, Garlic, Onions, Winter Squash. 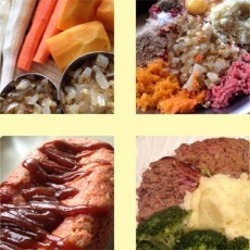 We love meat loaf, particularly when paired with fluffy mashed Potatoes and steamed Broccoli. In particular, we love the kind of meat loaf that has a light, fluffy, smooth texture, not coarse, heavy or dry. 1. Put the ground beef in a large bowl. 2. Finely dice the Onion. Cut the Garlic into very fine slices and rough chop. Sauté the Onion and Garlic in 3 tablespoons of olive oil over low heat while stirring until soft, about five minutes. Set aside to cool. 3. With a box grater, grate the Parsnips, Carrots and Squash on the very finest grater to shave each into a light flurry. 4. With a mini-chop (or a Ziploc bag and a meat pounder), crush the stuffing cubes to finely ground crumbs. 5. Preheat the oven to 350ºF. Add the sautéed Onion and Garlic, grated Parsnips, Carrots and Squash, eggs, salt and pepper and stuffing crumbs to the ground beef. Mix thoroughly, yet lightly, with clean hands. Do not overwork because it would cause the beef to toughen. Just make sure that it is evenly combined. 7. Bake at 350ºF for an hour. Remove it from the oven, tent with aluminum foil, and let it rest for ten minutes before serving.